The packed list of events for the 2019 JORVIK Viking Festival, which takes place in York, England, from Wednesday 20 to Wednesday 27 February, has now been revealed, with the forgotten stories of Viking women and the influence they wielded weaving a thread throughout the fantastic festival programme. In a change to previous years, the 2019 JORVIK Viking Festival will straddle two weeks – running Wednesday to Wednesday to accommodate different half-term holidays in neighbouring regions. With the weekend now falling in the middle of the Festival, visiting families can enjoy the spectacular parade through the city centre, Strongest Viking and Best Beard competitions and spectacular evening son-et-lumière event, as either the start or the end of their Festival visit to York. This year’s Battle Spectacular will transform the Eye of York, in the shadow of Clifford’s Tower, into Fólkvangr Fields – the meadow ruled over by the goddess Freya, where half the warriors who died in battle would go, with the other half being sent to Odin’s Valhalla. 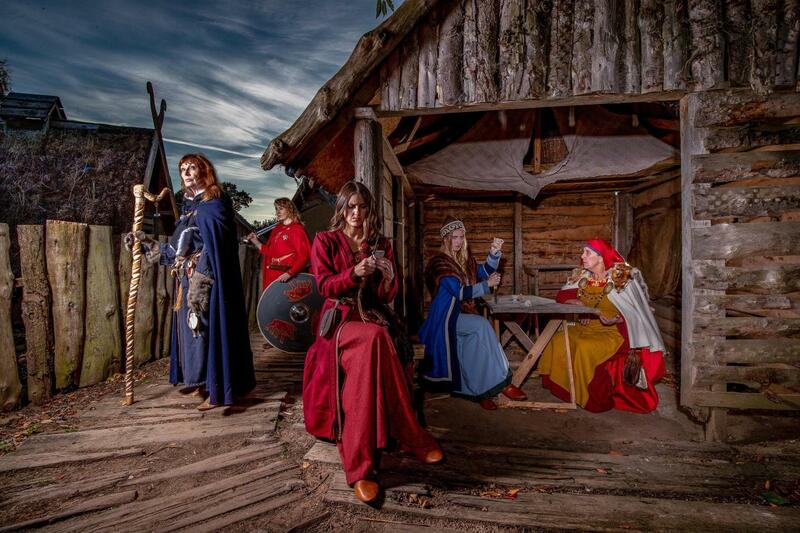 Five strong Viking women will tell their stories of settlement, revenge, politics and courage, re-enacted by a cast of 100 Viking warriors, and culminating in a fiery finale of pyrotechnics from Clifford’s Tower. Experts and performers from all over the world will join this year’s JORVIK Viking Festival, including Danish artist Myrkur, who is bringing her incredible Folkesange set to The Barbican on Thursday 21 February, courtesy of Descended from Odin, the ethical clothing brand which is sponsoring this year’s Festival. Kristin Noreng-Fjellheim, the expert ‘tekstilheksa’ (textile witch) from Norway will run a Viking embroidery workshop (21 February 10am to 4pm, £65), whilst Mari Wickerts of Gothenburg Museum returns to teach the art of Nalebinding (Norse knitting with one needle) in workshop for beginners and advanced students (26 February, 10am to 1pm and 2pm to 5pm for beginners, or 25 February 10am to 1pm for advanced, £20 per person). Some of the Festival venues have moved this year to allow for the growing audience which attends year-on-year. The main stage – used for storytelling, demonstrations and competitions, will be in St Sampson’s Square. Spark:York will provide the perfect venue for young warriors to learn sword skills, with daily workshops from 10.00am to 4.00pm (£5 per child). Adjacent to the Viking encampment on Parliament Street will be the new Nine Realms Bar, a new venture by Valhalla and Brew York serving locally-produced ales and beverages into the evening. JORVIK Viking Festival, organised by the events team of York Archaeological Trust, is one of York’s largest events, now in its 35th year. JORVIK Viking Festival is believed to be the largest Viking festival in the world, last year attended by over 63,000 visitors and bringing over £6.6 million into the local economy. For more information on this year’s JORVIK Viking Festival, and to book tickets, please visit www.jorvikvikingfestival.co.uk. Tickets are selling fast with a number of events already sold out, so early prebooking is strongly recommended. Eat, Pray & Love Bali! The most amazing rooftops for a fantastic 2018 New Year’s Eve party!